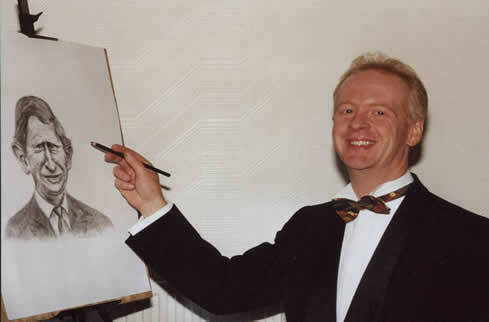 For over a decade , Richard Ellis has been entertaining people throughout England, Wales and beyond, with caricatures at almost every kind of event, from wedding receptions, cruises, trade shows and product launches to university balls and private parties. His list of clients includes BT, Vodafone, the Army, Royal Air Force, Volvo, Dell, P&O, Jaguar, BP, Capgemini, Shell, RBS, KPMG, Selfridges, Barclays and many more household names. Recent live celebrity 'victims' have included Phil Tufnell he couldn't get out of it, Nicholas Parsons it took just over a minute, Linda Lusardi he managed to concentrate on the face, Jayne Torvill it got straight sixes for artistic impression and McFly all at once!. Richard has experience of working at many venues, ranging from your local pub or club to Blenheim Palace and even the Houses of Parliament!